Rudy's was one of the first places I ever had vegan pizza, and I have to say I love it now as much as I first loved it so many years ago. 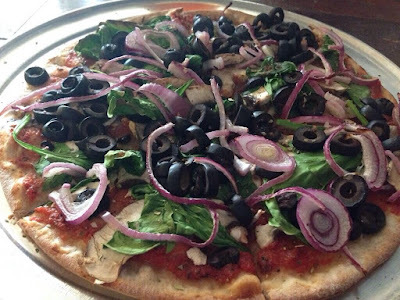 I am partial to the choose-your-own veggie pizza without the daiya vegan cheese, as seen in the photo above, but either with vegan cheese or without, Rudy's has got you covered. This place is fabulous and continues to be one of my go-to spots, even after all this time. They have a pizza for everyone, whether omni, vegan, or gluten-free. Rudy's is another example of an awesome restaurant that I am so happy is in Bellingham! Whether dining in or taking out, you can't go wrong with Rudy's. 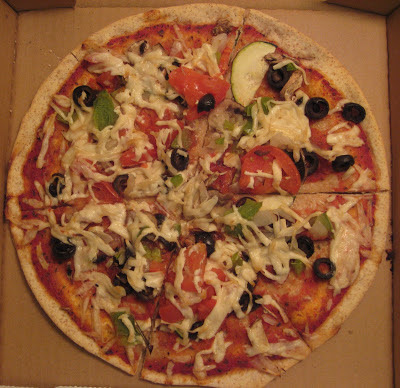 They have a huge variety of pizzas you can choose from, and they are very very vegan-friendly, even offering vegan cheese if you so desire. When dining in, their wine choices are decent and quite economical, and it is easily affordable to buy a bottle of red to share which will go nicely with your pizza. The decor at Rudy's is cheery and happy, and I really enjoy the colorful mosaics. A couple of weeks ago I had dinner there and enjoyed an olive onion and spinach pizza, one of my favorite combos. I think my favorite thing about Rudy's pizza is the sauce, which is so good that if you aren't a fan of vegan cheese, you can go for straight veggies and no cheese and be satisfied. Good pizza sauce means a lot, especially on a cheese-less pizza, and Rudy's has it down. The owner of Rudy's Pizza comes into the Co-op all the time and I mentioned Daiya to him on 2/12. He got some within a week, yesterday he told me he had it & was ready to go. So we're going to Rudy's to get a Daiya pizza this weekend. How cool is that? That's WAY cool!! I will try it out soon for sure! we are on a train from Portland to Vancouver, Canada, and want to order from Rudy's for delivery as we roll into the station! Is there an email address for ordering? I used to work at Rudy's around 2008 and I agree--BEST pizza sauce EVER. I'm moving back to Bellingham soon and, now that I'm vegan, I'm excited to have that pizza again because of how good their sauce is. (I also prefer no cheese, even vegan cheese, and have noticed how much the quality of the sauce can vary.) Thanks for making this website!